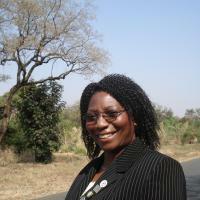 Dorothy Ngoma is executive director of the National Organization of Nurses and Midwives of Malawi and is an Oxfam Ambassador. She is an incredibly powerful speaker with more than 30 years of experience working as a nurse, training nurses and lobbying on behalf of nurses in Malawi. Ngoma recently visited the UK to work with Oxfam as an ambassador to discuss the need for health for all in poor countries like her own  Malawi. She met with politicians, ambassadors and nurses from around the UK to lobby and gain support for Oxfams Health and Education For All campaign. The campaign highlights the health crisis facing countries like Malawi and the need for more health and education workers.